Concluding the trilogy that started with the bestselling memoir First They Killed My Father, Loung Ung describes her college experience and her first steps into adulthood, revealing her struggle to reconcile with her past while moving forward towards happiness. After the violence of the Khmer Rouge and the difficult assimilation experience of a refugee, Loung's daily struggle to keep darkness, anger, and depression at bay will finally find two unexpected allies: the empowering call of activism, and the redemptive power of love. 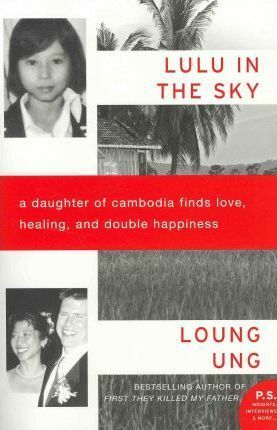 Lulu in the Sky is the story of Loung's journey to a Cambodian village to reconnect with her mother's spirit; to a vocation that will literally allow her to heal the landscape of her birth; and to the transformative influence of a supportive marriage to a loving man. When readers first met Loung Ung in her critically acclaimed memoir First They Killed My Father, she was a young, innocent child in Cambodia. But forced by the Khmer Rouge into the life of a child soldier, she soon found herself locked in a desperate struggle for survival in Cambodia's notorious killing fields. In Lucky Child, her life took a turn. As a refugee in Vermont, she grappled with post-traumatic stress, cultural assimilation roadblocks, and the abandonment of her sister in Cambodia. Now, Lulu in the Sky tells the next chapter in Ung's life, revealing her daily struggle to keep darkness and depression at bay while she attends college and falls in love with Mark Priemer, a Midwestern archetype of American optimism. Lulu in the Sky is the story of Ung's tentative steps into love, activism, and marriage--a journey that takes her to a Cambodian village to reconnect with her mother's spirit, to a vocation focused on healing the landscape of her birth, and to the patience and unconditional support of a very special man.